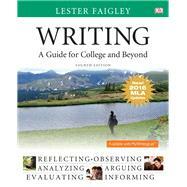 Writing: A Guide for College and Beyond presents writing, reading, and research processes dynamically, using a variety of visuals to illustrate how readers interact with texts and how writers compose. One of the first textbook authors to focus on multimedia composing, Lester Faigley employs his own advice to engage readers in every step of the writing process--for everyday life--and pulls back the curtain on how writers work. In the 4th Edition, individuals can also practice and explore what they’ve learned chapter-by-chapter with interactive MyWritingLab tools, assignments, and projects. What Makes Good Informative Writing? Katherine Mangan, Is Faster Always Better? What Makes a Good Causal Argument? What Makes a Good Evaluation Argument? What Makes a Good Position Argument? What Makes a Good Proposal Argument?